The Creativity Post | Which Art Market is Right for You? A brief comparison of the art markets and a quick quiz to assess where you and your money fit in. In general, the “art market” is divided into primary and secondary markets with the secondary market being the one that people generally think of when they think of the art market. This is the auction houses and big name galleries with headline sales numbers and familiar artist names. “Secondary” refers to the fact it has already been sold at least once before and is being resold with the intent of making a profit. Sometimes this is simply due to the duration that the work has been in the market. I like to think of this market as the “Historical Art Market” since predictions can be made and information is readily available on the artist and the works. The primary art market is a bit trickier, larger in scale and not as regulated. In general, the work is being sold for the first time and involves living artists who, for purposes of comparison to the secondary market, are relatively unknown on a global scale. Within this market there is a realm of passion, genuine interest and possibility for all involved which is why I like to refer to it as the “Creative Art Market”. The value of art in the Creative Art Market is based on skill, potential and creativity, rather than historical reference, prior auction results and investment strategy. It is important to note that there are current, living artists who have artwork in both the primary and secondary art markets but for simplification of choosing the market right for you we will consider them to be distinct. Of course, the art world in general is full of creative people but it is within this Creative Art Market that you get the most creative individuals. This does not strictly refer to the creativity level of the artists who push themselves in a sea of competition but to the creativity of sellers as well. Dealers and galleries first have to find those artists in today’s market whose skill, dedication, and ability can withstand the rigors of competition and who they believe will have longevity in the market. There is no guide book for this type of selection and it is often part of a dealer or gallery mission statement to provide focus to their selection. Artwork in the Creative Market is very much for investment but its future value is just less predictable. The idea is for dealers and galleries to appropriately assess value to the artwork they represent so that, at the very least, the work will always hold its original value, which is one of the great things about investing in art. So, how do you know which market is for you? Budgetary restraints may keep you out of the Historical Art Market but note there are plenty of works available by well-known artists under $5,000. You may be limited in flexibility to purchase and invest in the most well-known or desired works by a particular artist as these works tend to be higher in price. This is where it is important to assess what you want your relationship with art to be. · Do you love being surrounded by original works of art that have personal interest and value as well as the potential for growth? · Do you have a few hours a week to spend on exploring galleries, art fairs or artist studios? · Do you enjoy building relationships with artists or those interested in the arts? Answered “Yes” to one or more of the above, please jump to the “I’m a Creative Art Market Shopper” section. · Are you looking to make a long term investment with the hope to resell the work later? · Do you have limited funds that you only wish to spend on investment? · Do you prefer if someone else makes art investment choices for you? · Is it important for your art collection to have brand names that are familiar to your guests, friends and family? If you answered “Yes” to one or more of the above section, skip to “Bring on the Historical Art Market”. You are adventurous and not risk adverse. Dive into the Creative Art Market, create a budget and buy with passion, but do not neglect research and assessment of the artists’ backgrounds and skills. Your investment strategy outweighs your passion for art. Depending on how much time you have to invest your funds, you may want to engage a dealer or consultant to help make decisions and help to strategize building your collection. Still undecided? You can invest your time and money in both of these markets and not necessarily one or the other. Just be ready to make a time as well as a financial commitment to start learning about potential artworks for your collection. Keep My Heritage Off Your Underwear! 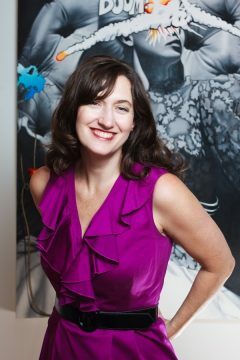 Jessica L. Porter is the founder and director of Porter Contemporary, a Chelsea based contemporary art gallery representing emerging and mid-career artists from around the world. With a unique background in art history, languages and law, Porter also advises other businesses and individuals on growing their arts activities, art collections or simply providing the tools to learn more about art. She has launched various programs in the arts industry over the last six years including an arts rental program through Porter Contemporary and ArtToGift, an online arts program focused on offering affordable art. In addition and sometimes in combination with her work in the arts, Porter takes a strong initiative in being a mentor and leader to other women through her launch of Raandesk Women, her membership and committee leadership in ArtTable and her work with the Girl Scouts.